Today, I Choose To Be Thankful! 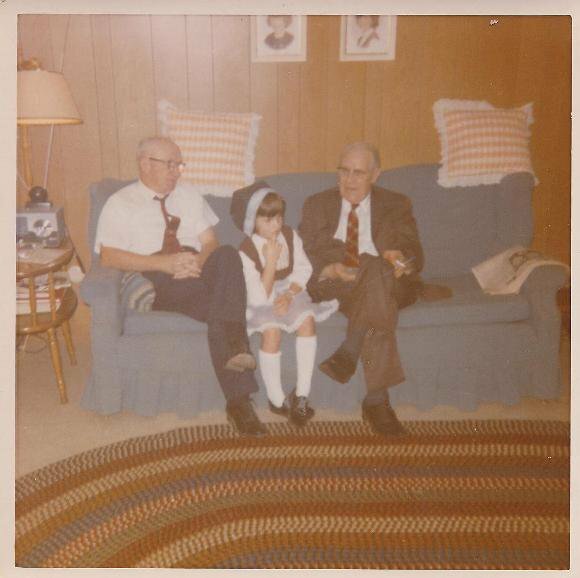 Me, Grandpa Walsh, and Daddy Bill…waiting on the traditional dressing! It has always been important for me to be able to cook Thanksgiving dinner as well as my mom so that one day I might carry on her traditions. My first year of marriage, I was determined to have my parents over for dinner with me having prepared an entire Thanksgiving feast just for practice. Mom came over the night before and helped me put the dressing together. Then the next day, she came a little early to help out where she could, so I asked her to make the gravy. She started looking around and finally asked me where I had put the giblets. “Giblets? I don’t know, what’s that?” Well, you’ve probably guessed it; although my first turkey was very moist and tasty, I had forgotten to take the bag of giblets out of the middle of it before I cooked it! Just minor details…after a few laughs, it all worked out OK.
Over the years, Mom continued to pop in to help and offer advice on the dressing or other items that I was preparing. I have learned that even though she didn’t have an exact recipe for her wonderful dressing, there was a certain technique to getting it right year after year. Last year, my mom was no longer with us to come and offer advice or help make the gravy. I felt it was very important now more than ever that I pass along the family wisdom to my children so that they too, might be able to carry on our traditions once I am gone. With that in mind, last year, I asked my son to get up early and help with the dressing making. He’s the one in the family that might actually make it again someday. It was a special time as I carefully explained the art of Grandma’s dressing and was excited that he was enthusiastic about learning the family secrets. I cherish special times with my loved ones like that and am thankful that God has put each one into my life. I imagine that my mom probably felt the same when I was eager to learn as well. Reflecting this Thanksgiving season, I am reminded especially as Americans, we have so much to be thankful for in even the little things we take for granted. Even though our nation is in tough times right now, we can be thankful that we are free and among the wealthiest people on this earth despite what our government budget looks like today. I was driving through some small towns last week and although we are said to be the wealthiest nation, I was disturbed to see several homeless people on the side of the road digging through trash barrels as I drove by. I might expect this in downtown Cincinnati, but not in the smaller rural communities for some reason. For the last week there has even been a gentleman standing on a street just down from my home with a sign reading “unemployed, will work for food”. Sometimes I feel led to give what I can to those alongside the road and other times I drive on by in fear or disbelief that they are actually homeless. In today’s world, you just never know who you can trust so I wonder how many people who are truly in need that I pass by because of those who have falsely proclaimed to have need when they really weren’t needy at all. Where do we draw the line? Do we just give to everyone with their hand out and hope that they are sincere? Or do we just pick and choose the ones we will give to by how we have determined to size up their need? I know there are several people who have enjoyed middle to upper class lifestyles and are now finding themselves unemployed and without money for groceries next week. If I were to look at them, I would think that by the clothes they wear and the cars they drive, they are not in need. However, in today’s world, we really can’t make that determination. Joblessness is affecting people from all walks of life. Of course, someone who owns a home, cars and other valuables are in a lot better shape than someone living on the streets, but it doesn’t diminish the fact that times are tough for a lot of people. One day as I was out showing a client homes to buy, we came up on a dad with three kids who were walking through the house we were there to see. It was a scene that is becoming all too familiar and I cautioned my buyer to stay in the car until we determined the mindset of the man there. The kids were bringing things out of the house, mostly clothing, and putting it into the trunk of their tiny car. Thankfully the man was not angry as some are about their circumstances and told us to come on in to look at the house. My heart broke as I walked through this house that used to be called home for this family. The kids were walking kind of aimlessly through the structure looking through what was left of their once prized possessions now strewn across the floors while trying to determine what they were going to need in the next several months. There were TV’s on the walls, exercise equipment, furniture, toys and even treasured photographs lying around they were leaving behind. I think this family was realizing that all of those things weren’t near as important as they once were. I don’t know what happened to that family, but I know this scene is replaying every day across America. We can read about it in the news reports but it doesn’t really become real until we are literally face to face with the reality of people losing their homes. Perhaps you know someone personally who has lived through this scenario. I suspect each one of us knows of someone since it is so widespread. During this holiday season, I may not have all of the answers to homelessness and unemployment but one thing is for sure–I am thankful. I am thankful that I am not currently losing my home or living on the streets like those who have crossed my path lately. I am thankful for my salvation, for my husband who cherishes me, for my family who loves me, for good friends, for our home, our jobs, and for a refrigerator with food in it. This Thanksgiving, we will have an empty seat at our table as my son serves our military in Afghanistan. I am thankful for his service but I will be even more thankful when he returns home safe and sound. For now, I will just hold onto the memories of last year’s special time with Rob and be thankful that we shared that time together. As a nation in trouble, I pray that we will be a people of prayer. I hope that those reading today will take a minute to pray for our nation, for our loved ones, for our economy, for our military, and praise God for the blessings He has bestowed on His people today. Perhaps it is good our nation is suffering a bit. It seems like when times are good, we forget to look to God. However, when we and our loved ones are suffering through hard times, I would hope we would be reminded to look up and ask God to intervene. I hope that each one of us will pray for God to show us how we can help those in need around us while thanking Him all the while that we personally can be used in some small way. The Bible says in 2 Chronicles 7:14 (NKJV), if My people who are called by My name will humble themselves, and pray and seek my face, and turn from their wicked ways, then I will hear from heaven, and will forgive their sin and heal their land. May we choose to give thanks and praise for all things this holiday season and never forget the One who makes it all possible! Happy Thanksgiving! Previous When Life Feels Like it’s Spinning Out of Control… Next If Your Table Could Talk, What Would it Have to Say?